We had this computer when I was a kid. The venerable Apple IIe. I didn't use it all that much; we had a few games but the only one I remember was Super Boulder Dash and I only remember that title because I could never figure out how to play it. I wish I could recall the other games we had. I didn't do much typing on it, I was young and hadn't become the manic writer I am now. I wish I could find a pic of the Brother wordprocessor we had. I spent so many hours hunched over that thing writing stories and journals and such on this tiny black screen with yellow letters. A few years after the Apple IIe I got this for Xmas: The "PXL 2000" (didn't you love when sticking a "2000" on the end of something made it seem so untouchably hi-tech?) 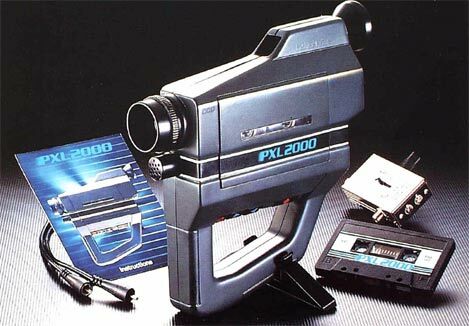 Anyway, it was a Fisher Price video camera that recorded video onto audio cassettes; the video played back via a 4.5 inch black & white monitor that came with the system. I still come across random cassettes that I must've recorded movies on back then because when you play them through a stereo it sounds like whales bellowing underwater. A brilliant invention methinks. I heard these things got popular again recently too among these quasi-independent, experimental/avant-garde, and underground filmmakers due to its unique low-resolution pixelated black & white image. Whatevs. I got a real kick out of this thing back in the day.